This area is characterized by the business districts within it, particularly along State Street. The State Street corridor, between Ellsworth and Michigan Avenue, is a vibrant center for a diverse set of employers ranging from alternative energy and technology firms, to light manufacturing, such as printing and medical equipment facilities. There is an urgent need to redesign State Street to accommodate multiple modes of transportation and incorporate greenscapes. The Oak Valley Business Park (which has some Industrial Development Districts) is off of Ellsworth Road and becoming increasingly attractive to information and other technology-based firms, especially those seeking close proximity to residential units on the west. 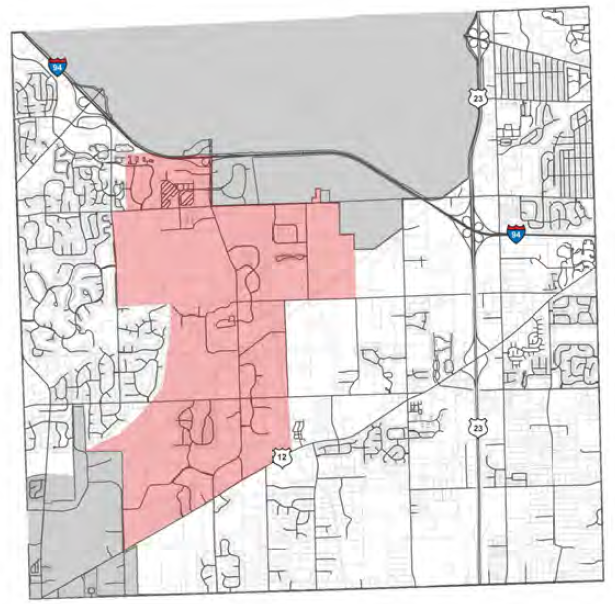 This area also includes the Ann Arbor airport, which is owned and operated by the City of Ann Arbor, and some commercial activity toward the southern edge of the West Central area.